A San Francisco ballot measure that sets data-privacy goals, but rankled transparency advocates, appears to be passing. As of 8:35 Wednesday morning, the count shows that 57 percent of the electorate voted to approve it, while 43 percent voted no. Proposition B, the Privacy First Policy of the City and County of San Francisco, was written by Supervisor Aaron Peskin and placed on the ballot by a unanimous vote of his colleagues. It would require the city administrator to create a framework to guide policy decisions when it comes to corporations collecting and storing people's data in San Francisco. The measure had drawn over 56 percent of early vote-by-mail and election-day tallies, counting about 30 percent of the expected total. The opposition trailed with 43.21 percent of votes. 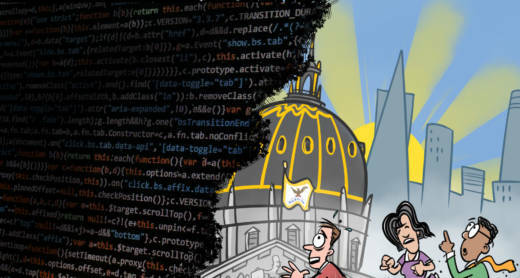 Proponents touted the measure as a chance for San Francisco to lead on the issue of data privacy, and Proposition B is seen as striving for stronger protections than the state Consumer Privacy Act set to take effect in 2020. Government transparency advocates, local newspapers and journalism organizations opposed Proposition B over fears that a clause in the proposed charter amendment would allow city supervisors to amend — and potentially weaken — San Francisco's landmark open records law. Proposition B laid out 11 guidelines for protecting private data. Those guidelines included things like allowing individuals to access the personal data that's collected about them, and “de-identifying data” so that particular data points could not be traced back to individuals. “As a hub of tech innovation, San Francisco should be at the forefront of data privacy protections,” supporters wrote in official ballot arguments. Opposition led by the Northern California Society of Professional Journalists and joined by the national Reporters Committee for Freedom of the Press wrote that the measure is "a hollow effort to protect privacy" that "wouldn't give our elected officials the authority to do much, if anything to protect privacy that they can't do already." Personal data has been at the center of numerous scandals inside the tech world over the last few years. In the last year alone, Google, Facebook and many others have had major leaks, exposing sensitive data of millions of users. San Francisco is often one of the first places new Silicon Valley companies try our their new products and services. Everything from Lyfts, Ubers and scooters to robot delivery machines have rolled out on the city's streets. Collecting and monetizing personal data is often part of the business model of these Silicon Valley companies. Media organizations like the San Francisco Chronicle and the San Francisco Examiner criticized the proposition, saying it opened the door to tampering with the city’s Sunshine Laws, which allow journalists to trace individuals involved and doing business with the city.